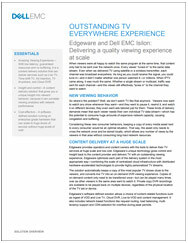 Edgeware and Dell EMC Isilon: Delivering a quality viewing experience at scale. With low-latency, guaranteed resources and no buffering. The joint Edgeware and Dell EMC solution allows development of a TV delivery system that scales more cost-effectively than other architectures. It creates a common platform for multiple TV services and Cloud DVR, providing visibility into how viewers are experiencing their content. And most important of all, it’s a solution that will deliver viewers an amazing viewing experience.